The market nearly succumed today following a dramatic test of the All One Market hypothesis. In a lame attempt to curry favor with voters, the administration waged war on high oil prices. They brought a peashooter to the front lines, but their first shot hit the market right between the eyes. In a move as carefully orchestrated as the silver take-down in May, oil fell a swift 5%. Ah, but the law of unintended consequences. Stocks fell in lock step, matching oil’s decline to the minute [see: Not Terribly Slick]. And, the $800 million which might be saved over the next week or so of lower crude prices was quickly dwarfed by $50-100 billion in market losses. Oops. Luckily, Benny and the Jets came to our rescue (was there ever any doubt?) The Plunge Protection Team dispatched trucks of cash to every street corner in Manhattan, free samples for anyone promising to buy a share or two of stock. The DJIA, which was down 234 at one point, closed down a relatively tame 60. SPX closed down 3 instead of 25. And King Dollar, up almost 1.5% since yesterday’s close, fell back to a more princely .6% gain. Almost every index I watch left either a bullish hammer or a shooting star on its daily chart. For the faithful who read and believed Deja Vu All Over Again and Deja Vu All Over Again, Again, this was an enormous buying opportunity. Consider the June 132 SPY calls, which traded as low as .02 and subsequently rose to .12. I hope at least a few of my brothers in arms felt as I did and added to their longs at 1265. Although the politicos threw us a curve, the topping pattern is still intact. There was some question as to when the B in the A-B-C corrective wave would make its appearance. The trend line off the 4/21 gap was doing a great job yesterday and up until just after I posted about it last night, but obviously got clobbered by today’s action. The pattern found a substitute support trend line — the latest fan line from 10/31/10 that was formed when we put in the 6/16 low. It’s seen in the above chart, running from (1) to (4). If history repeats, and it always does, this line will come into play again in the next week or two — probably as support at Point B and resistance as we’re backtesting from Point D.
Also, note how the various numbered points generate meaningful fan lines. 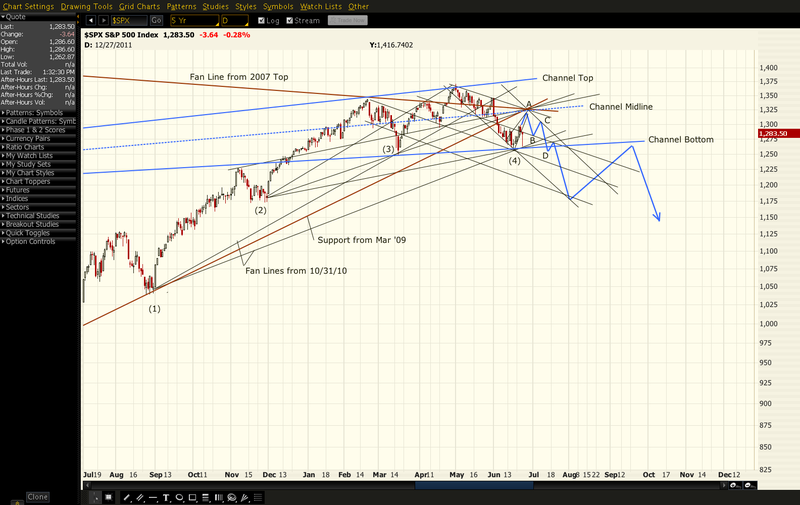 Point (1) is the intersection of an important low with the trend line from the Mar ’09 lows. Its top line provided primary support from 3/16 to 5/16. Once the market dropped through it on 5/23, it acted as resistance for the backtest — determining the 6/1 interim high of 1345. The middle fan line from Point (1), also our Mar ’09 trend line, will define Point A. And, the bottom fan line has, as already stated, saved the market’s bacon on two occasions: 6/16 and today. Examine the other fan line points of origin. Point (2)’s top line determined the 4/8 and 5/2 highs. 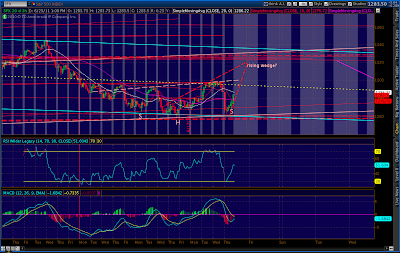 Its middle line, the 3/16 low and future Point A. And, its bottom line coincided with the 6/16 low. Note that each subsequent origin point has its own sphere of influence, but they often intersect. These points of confluence are especially important to market action. Examples include Point (4) and future Point A. I’m expecting another near the backtest of the channel bottom and will probably move Point D to reflect that once it’s revealed. My best guess is that the 4/18 low will act as a point of origin, possibly determining Point B and the backtest intersection point. At 7:30 pm PDT, the futures look to erase all traces of today’s debacle. Tomorrow should continue what would/should have happened today. I fully expect to reach Point A in the next several trading days. We have a bullish hammer candle and very positive technical indicators that should see us to at least 1300 tomorrow. 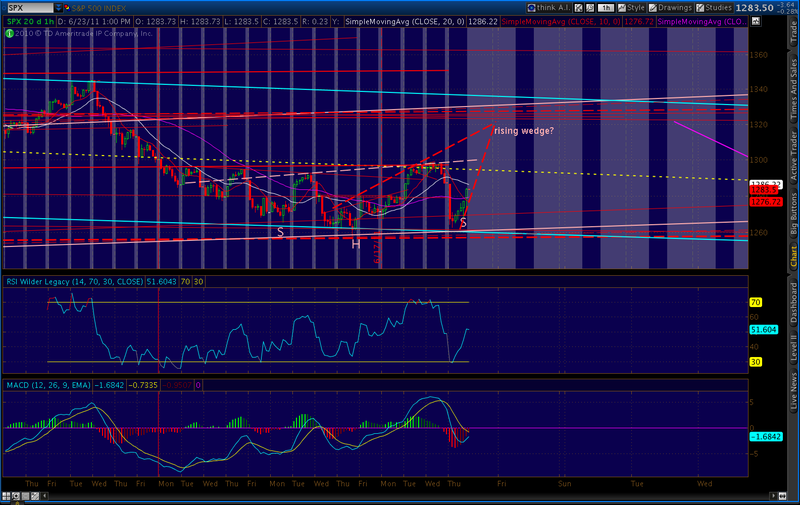 At that point, we will have completed a (somewhat lopsided) Inverse H&S; pattern that has upside potential to 1328. The rising wedge I was following obviously paid off with today’s plunge, but we may have established a new one with a wider base. I’ll be watching it, as a similar pattern played out at the equivalent point in 2007. 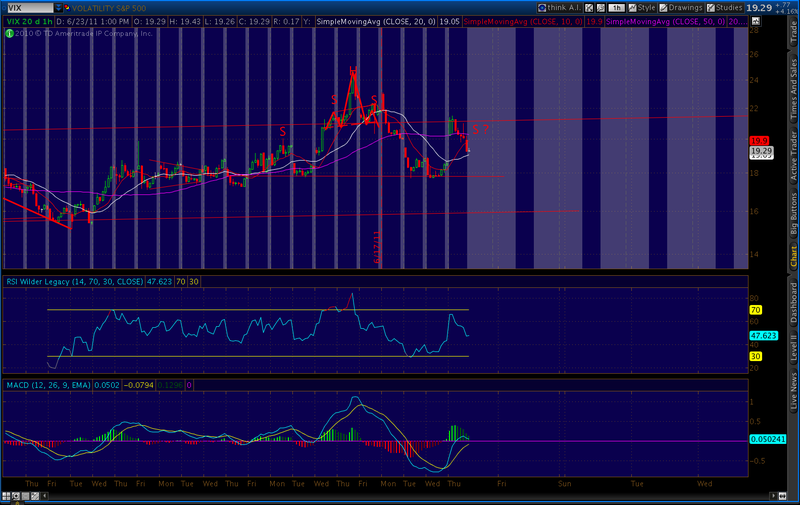 A strong opening tomorrow should also complete the H&S; pattern I’ve expected in the VIX. Believe it or not, the potential target here is 11 — a number we haven’t seen since 2006. We looked at this pattern here and here. While I don’t believe we’ll actually reach 11, the mere completion of the H&S; will generate a lot of bullish enthusiasm. I expect it to drive the market to Point A with enormous enthusiasm. Even after we pull back, most will expect it to be a corrective wave on the way to a new high. It will be the last and bloodiest time anyone’s tempted to BTFD for a very long time. Great work pebblewriter, keep up the good work.